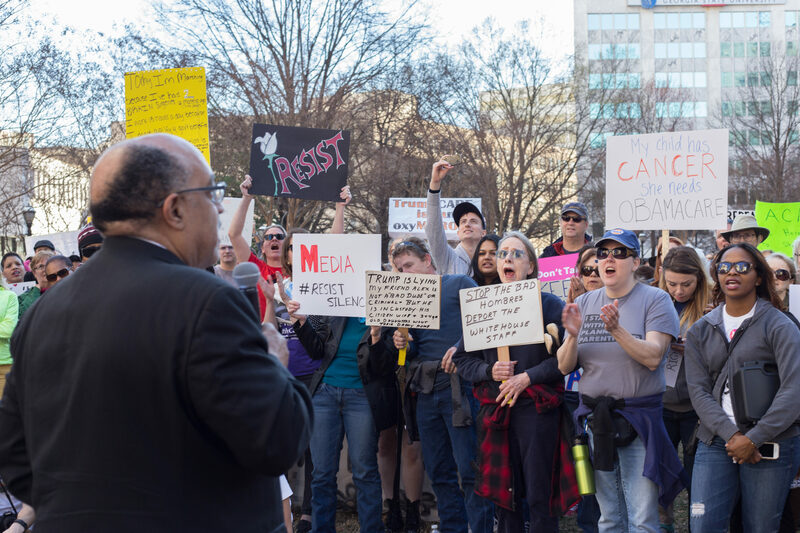 On Feb. 25, hundreds of Atlantans took to the streets to protest the government’s threats of repealing the Affordable Care Act, aka Obamacare. “We’re here to send a message to the city of Atlanta, to the state of Georgia and to the entire nation, keep your hands off our healthcare,” Attorney Gerald Griggs, co-organizer of the march said. Griggs said they’ve been trying to meet with senators for five weeks and they have refused to meet “with the people”. Effective March 2010, the Affordable Care Act (ACA) is a health care statute created by former President Barack Obama that serves to reduce the uninsured population by providing higher quality and more affordable healthcare. Included in this statute is the “Prevention and Public Health Fund”, which according to the Atlanta Journal-Constitution (AJC) provides about $20 million in funding for a variety of Georgia projects and research institutes, including the Department of Public Health, the Centers for Disease Control (CDC), Morehouse School of Medicine and Georgia State. CDC’s Director of Asset Management Services Jeff Williams said one of the unattended consequences of repealing the ACA is the slashing of funding to state and local public health offices indirectly through grant funding via the CDC. And besides research funding, employees could be at risk, according to Williams. While the funding of public health offices could be affected by the repealing of Obamacare, Georgia’s public institutions could take a hit. As reported by the AJC, the Prevention and Public Health Fund actively aids Georgia State’s School of Public Health as it conducts research with both Dekalb and Fulton counties, costing a total of $900,000. According to the National REACH (Race and Ethnic Approaches to Community Health) Coalition, Georgia State’s School of Public Health and Morehouse School of Medicine’s Prevention Research Center obtained a $400,000 REACH grant from the CDC to combat and reduce the rates of diabetes and heart disease in impoverished neighborhoods. Lee Rivers Mobley, associate professor at the school of Public Health, said that Georgia State may only be minimally affected by the repeal. The elimination of the ACA could ultimately affect public research institute funding, but it could also affect students’ health care. According to the New York Times, insurance provider Humana has decided to withdraw from Georgia’s insurance exchange and will not offer health insurance under the federal law. As professor Mobley said, if the healthcare act is repealed, it could affect those who have insurance outside of the workplace and students who are currently on their parents’ insurance plans. For Georgia State student Kristy Guilbault, healthcare is a right that everyone should have access to.